Digimon: System Restore: Fusion Episode 26: Shoutmon – Bogus King Or The Real Thing? 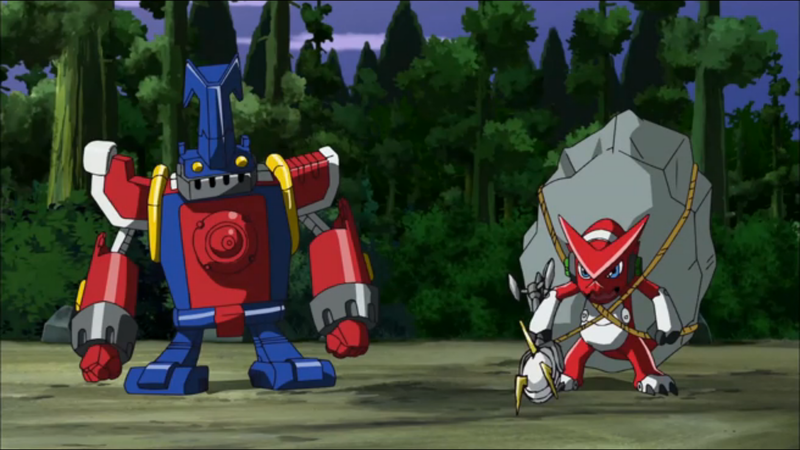 Fusion Episode 26: Shoutmon – Bogus King Or The Real Thing? In this episode, it would be a lot easier to concentrate on Shoutmon's dedication and hard work if this darn plot would stop getting in the way. As the first arc draws to a conclusion, things are starting to build to a boil. That's certainly evident here as we witness the fall of the first of Bagramon's three generals and finally get to see (part of) what's going on with Damemon. Other than the fact that Damemon's irritating as all hell, it's a fair twist. What complicates everything is that the plot is in catch-up mode, trying to make up for time spent focusing on less important angles that give some much-needed focus on characters like Nene, Angie, Jeremy and even Dorulumon and Blue Flare. Today was Shoutmon's turn, and the effort to give him appropriate attention while ratcheting the plot back up to full speed makes the episode a bit of a mess. It's another instance of two good things having to compete for attention in the same episode. While episode 19 was able to skate by because the two things were epically ridiculous and epically awesome, you can't go that far with Shoutmon's training and Blastmon's demise. They're good, but nobody's putting them down as hallmark moments of the franchise. Nobody's shocked that either of the two are happening, and there are factors in each of them that limit their potential impact. We get a long, hard look at Shoutmon's qualifications to be the king, and the scrutiny is appreciated. As the Fusion Fighters gain and the Bagra Army fractures, we should be asking whether or not Shoutmon would be able to serve the Digital World the way he wants. History has had plenty of leaders who had the right spirit and ideology without the ability to back it up. The last episode raised the question of whether Shoutmon is strong enough for the throne. 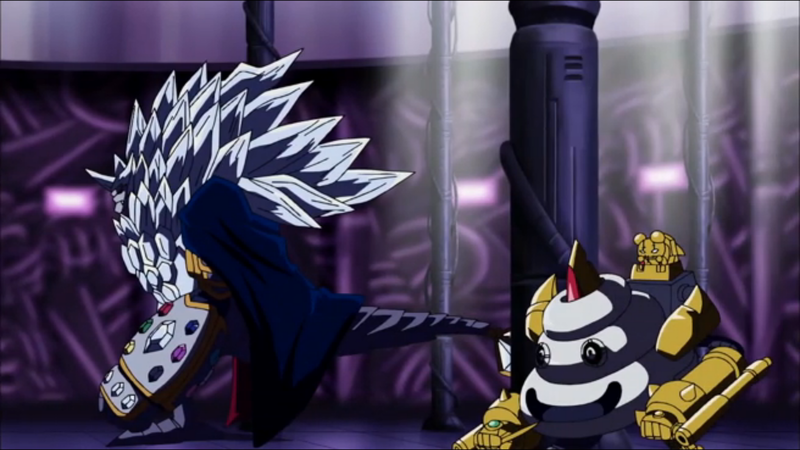 His sneaking off to train with Ballistamon and the (suddenly reappearing) Beelzemon is fun. It's also a classy move on Mikey's part that despite great suspicious and going so far to investigate, he doesn't disturb the training. Here's the thing: until last episode, that's not what we should have been worried about with Shoutmon. We're used to little guys growing to powerful beings, and the failure to hold a higher form falls on the human partner more often than not. The real question with Shoutmon is his ability to lead. Nobody had doubted his strength, and certainly his heart's in the right place, but when it comes to making actual decisions, Mikey's always in command. Shoutmon is fantastic as the heart of the team, but he's never been the brain. A good ruler needs to be both. That's what we need to see from him. The whole idea of Shoutmon being too weak to sustain a digifuse comes out of left field. It's manufactured, existing solely as a challenge for Shoutmon to overcome. In six seasons, the prolonged stress of a Digimon maintaining a higher form has never been brought up. Its introduction here is forced, but damned if it doesn't raise some serious questions. Why shouldn't a season's worth of evolving, devolving, merging and fusing have some serious physical and psychological toll on a Digimon? We've seen the impact the trip can have on the children, particularly in Adventure, and spirit evolution wore down the Frontier kids even if they didn't talk about it much. It's not a great place to introduce the idea, but it's hard not to think about now. Speaking of bad introductions, Damemon's influence in this episode is a total miss. If the episode focused solely on Shoutmon defeating Blastmon, we'd be cool. But the insistence on showing Damemon manipulating Blastmon into the challenge, and the underwhelming revelation that he's a double-agent dilutes everything. His relatively recent introduction forces us to care about him, while wondering why everybody's suddenly caring about what he has to say. Had Damemon been introduced at the start, we'd at least be inclined to tune him out, making his turn a little more interesting. Sort of like if we'd discovered that Neemon had actually been... well, anything really. There doesn't appear to be a max capacity in Mikey's Fusion Loader. Not only does he load the entire population of Disc Zone, we don't even see him doing it. I love the idea that Blastmon used crystal shards to get information on Mikey's whereabouts, but it would have been more fun if he had actually been able to compose himself there instead of his real form magically appearing back at base. The big drama over whether he'd be able to discern their location was a flop since Blastmon only received a tiny clue from the shards and pieced the rest together with logic. Which is sort of impressive for him actually. Also unnecessary clutter in this episode? Tactimon. That just felt like a reminder that he's still here. 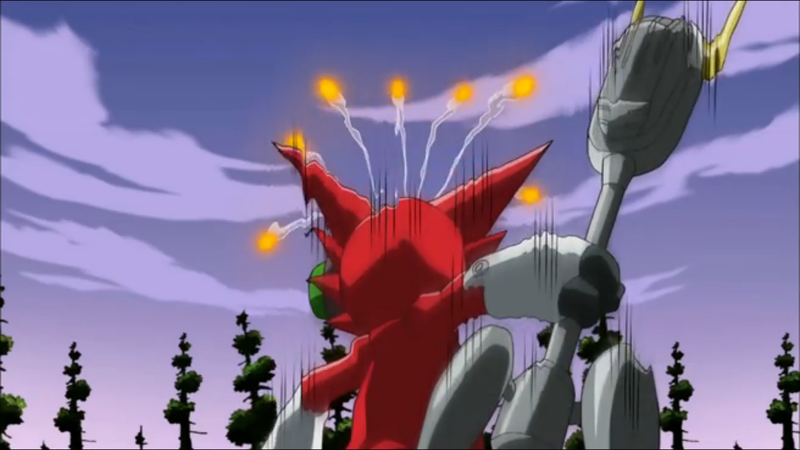 If the constant digifusing is taking a toll on Shoutmon, doesn't some of that fall on Mikey? He's got plenty of troops that he rarely uses, and there have been plenty of opportunities for Mikey to spell Shoutmon with some of them. Even Tai used squad rotation from time to time. Fusion Episode 27: Sweets Zone Bake-off! Fusion Episode 25: Showdown in Shaky Town! Fusion Episode 24: Monitamission Impossible!